I really enjoyed reading the Paranormalcy series by Kiersten White. (I'm impatiently waiting for book #3 to be released!) I love the cover for Mind Games, and even though the summary is short, it does sound like it could be a great read! I'm really excited for this one too; I love White's sense of humor and I hope that is present to balance out what sounds like an intense read! I'm looking forward to this one too. The cover is simply gorgeous! This does sound promising. I loved Paranormalcy but couldn't get into the sequel for some reason. I'll have to add this to my TBR list. Oooo looks good! Creepy cover, too. Interesting! I had seen this cover but never took the time to read the brief synopsis. I think I might be adding this one to my ever growing to be read pile! YEEEEEEEEES! I love Keirsten White and this one is supposed to be kind of darker, PLUS it is about sisters. Seriously, I might DIE if I don't get to read it soon. I'm waiting on this one too! I love Paranormalcy, but I can't wait to see how different Mind Games will be! And I love the cover too - I love all of Kiersten White's covers! :P Great pick :). Love, love, love the cover for this one and can't wait to find out whether it's as awesome as the (short) summary makes me want to believe. Awesome pick! I love the sound of this one. I have yet to read anything by White, but between this and her other trilogy, it looks like I have a lot of awesome to look forward to! I don't think this cover could be any more captivating or gorgeous! Its just so eye-catching, it draws me in every time. And Kiersten White's Paranormalcy trilogy has been so good so far, I can't wait to see what she has in store for us with Mind Games. I didn't know she had a new series coming out. I really enjoyed Paranormalcy and I know my students LOVED it too. Great pick! Great pick! This sounds amazing and isn't that cover beautiful!? 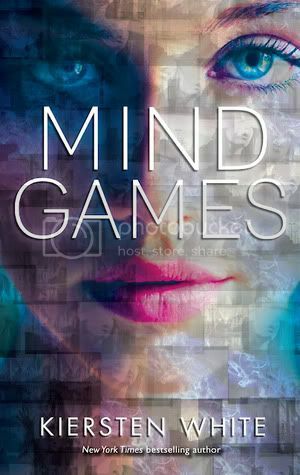 I haven't read her Paranormalcy series but I've heard enough to be stoked to read Mind Games! I'm so excited to read something new from Kiersten! OH YES!!! I can't wait for this--such a departure from her other series, from what I understand. And that cover is fantastic. I love the sound of this one! And that cover is so unique! What a pretty cover! I would definitely check this one out! Love the cover! Can't wait to get my hands on this one. Kiersten White has such a way with characters!